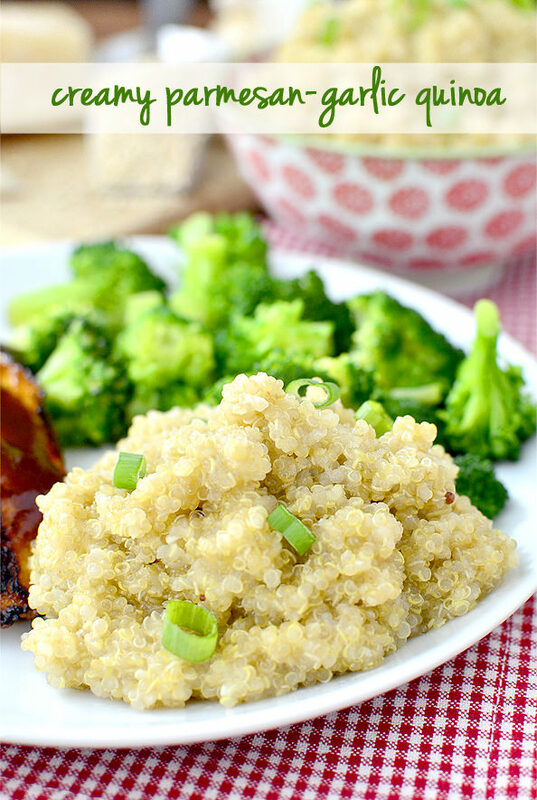 Gluten-free Creamy Parmesan-Garlic Quinoa is an easy side dish that's packed with protein and crowd-pleasing flavors. Rinse quinoa very well under cold running water in a fine mesh sieve then drain well and set aside. Heat extra virgin olive oil in a small saucepan over medium heat then add garlic and saute until barely golden brown, stirring constantly (watch closely as it can go from golden brown to burnt very quickly!) Add quinoa then toast for 1 minute, stirring frequently. Add chicken broth then turn heat up to high and bring to a boil. Place a lid on top then turn heat down to medium-low and cook until nearly all the liquid has been absorbed and quinoa is tender, about 15 minutes. Stir in parmesan cheese then serve.